When the government first introduced Auto Enrolment, they set a minimum percentage of the employee's pay that had to paid in to their pension pot each pay period. This was 8% of their "qualifying earnings", at least 3% of which had to be contributed by their employer. The government decided to introduce the minimum contribution gradually, starting off with 2% (with at least 1% contributed by the employer); then 5% from April 2017 (with at least 2% by the employer); and finally 8% from April 2019. Currently there have been no announcements about further increases, however, this could change in future. 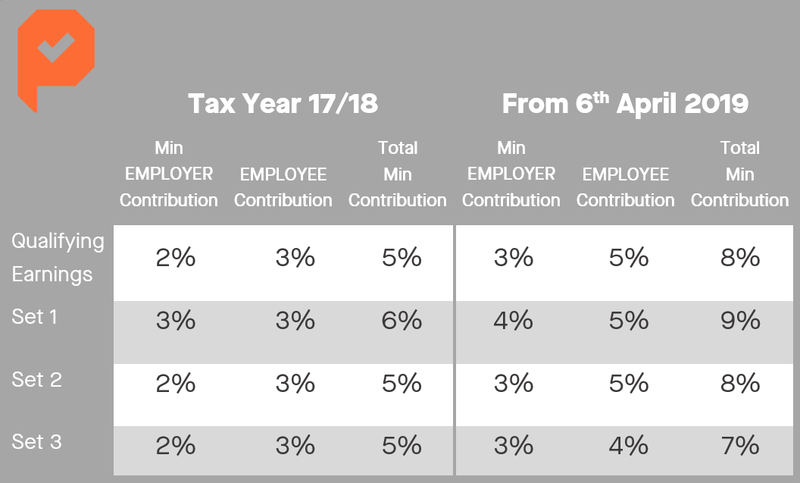 The table above shows the minimum contributions required for each of the four pensionable earning definitions you can use when calculating auto enrolment contributions. For illustration purposes, we have included the minimum employee contribution which will be required if an employer contributes at the minimum employer percentage. The employee has to contribute the shortfall between the employer contribution and the total contribution required. So, if an employer contributes at a higher percentage, the employee may reduce their contribution accordingly. The minimum contribution required under auto enrolment varies according to the elements of pay the employer has chosen to include when calculating the pension contributions, i.e. which parts of an employee's pay they define as 'pensionable'. The standard earnings definition is known as qualifying earnings. The other three earning definitions are known as Set 1, Set 2 and Set 3. There is an explanation for each earnings definition below. You can also find out more at The Pension Regulator's website by clicking on the Learn More button below. Qualifying earnings is the name given to a band of earnings that you can use to calculate contributions for auto enrolment. Every tax year, the Department for Work and Pensions (DWP) reviews and updates the upper and lower limit of the bands. In 2017/18, Qualifying Earnings were defined as all earnings between £6,032 and £46,350 a year. From April 2019, the bands will be increased to £6,136 and £50,000. Qualifying earnings include: Salary; Wages; Overtime; Bonuses; Commissions; Statutory maternity pay; Ordinary or additional statutory paternity pay; Statutory sick pay; And Statutory adoption pay. Contributions are calculated on basic pay. This does not include bonus, overtime, commission or certain staff allowances (such as shift pay or relocation allowance) in the calculation. This is similar to SET 1 in that contributions are based on basic pay and does not include bonus, overtime, commission or certain staff allowances (such as shift pay or relocation allowance) in the calculation. The difference between Set 1 and 2 is that if using SET 2, the employer must ensure that the basic pay for all staff in the scheme, when added together, are at least 85% of their total earnings. Contributions are calculated on all elements of staff pay and all earnings. You can find out more about our Auto Enrolment services here or call and speak to one of our friendly advisors!